Although our series on the Mughal Influence on Vaisnavism will focus primarily on the 16th to 18th centuries, we have digressed in these early segments to give some background on the intruders who preceded the Mughals. In northeastern India the Turks landed in Delhi in the 13th century, and the Sultanate flourished there until the Mughals drove them out. In northwestern India, the Muslim influence was felt well in advance of the Sultanate. In yesterday's segment, we focused on the Malwa region of Madhya Pradesh, where the Islamic presence was felt in the late 14th century. Today we'll look briefly at the history of Rajasthan, which serves as a good example of the transition from Vedic culture to Islamic presence, and back again to a Vaisnava influence in the arts. The period from the middle of the 7th century to the close of the 12th century, (approximately 650 A.D. to 1200 A.D.) is known as the Rajput Period. We have already mentioned the Rajput School of painting a few times, because it serves as a marker for cultural and religious transitions in devotional art. Early Rajput paintings have been described by academics as 'purely native creations of the Hindus'. In fact, their themes were firmly fixed in Vedic culture, typically depicting the ragas and raginis, with story content drawn from Sanskrit texts. While in music, the ragas and raginis were played at certain times to call up a particular association for the listener, in paintings they were personified, the characters being based primarily on Vedic literature. If we consider the timeline of some of the intruding regimes previously mentioned, the routing of the Rajputs is an early marker, in the late 12th century. The Malwa Sultanate took over, as noted yesterday, around the start of the 15th century. Babur didn't arrive until the middle of the 16th century, which marked the start of the Mughal Empire. So we can see how well in advance of the Mughals the Islamic presence had overtaken the Rajputs. The Rajput School of painting spans a significant swath of different styles and content themes, and these can be correlated to the predominance of a Muslim or Vaisnava mood in the land. In fact, the Rajput School can be divided into two phases: one prior to the Muslim invasion in the early 15th century, and a second phase starting in the late 16th century, in Rajasthan and the Punjab. The transition between these schools of art is clearly seen both in styles of painting, and thematic content. While staying true to their Vedic roots, the Rajput School painters produced a wealth of wonderful Vaisnava paintings. When expressing the Muslim influence, the content turned to scenes of battle, animal hunting and portraiture, with many court scenes featuring men and their courtesans, often posed to appear like the pastimes of Radha and Krsna. Needless to say, the latter paintings in no way compare to the Vaisnava themed pieces, which are like jewels compared to rough stones. But the Islamic influence cannot be blamed for all the nonsense departures from pious devotional content. The maharanas, or hereditary rulers of Rajasthan, became accustomed to having themselves depicted as supreme warriors, hunters and politicians. They were accorded the status of a demigod, and were worshipped as part of both court and temple pageantry. Paintings of the day featuring their grand darbars proliferated. Many of these paintings along with others done in the Islamic style, devoid of Vaisnava devotional mood, were produced throughout the region. In 1562, when Akbar defeated Baz Bahadur, the state of Bundi in Rajasthan (previously known as Haraoti) was the stronghold of the Rajputs. With Jaipur and Tonk to the north, Mewar to the west, and the state of Kotah to the south, a unique group of distinct schools of devotional painting emerged in the area. Geographically, this region is quite mountainous, with many rivers, dense forests and lush greenery. These landscapes were often painted by the Bundi painters in the period 1554 to 1569 A.D., while they were under the reign of a Mewari ruler, who later became a feudatory for the Mughals. While each is distinctly different, all the paintings on this page are good examples of the lush landscapes depicted by the various Rajasthani schools. 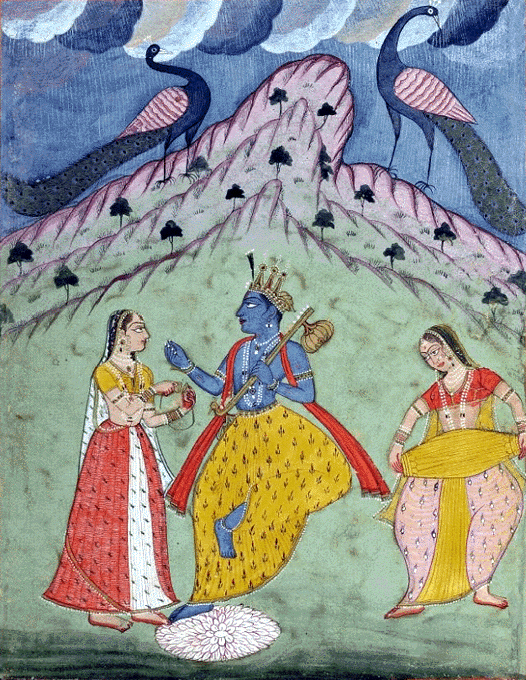 The Bundi painting at the top of the page is much softer in hue, compared to the jewel tones of the two Bikaner paintings. Whereas the landscape is painted in more of a Vaisnava style in the Bundi painting above, the two Bikaner pieces have more of a Persian influence in the depiction of trees. In the Megh Malahar scene below, the Islamic style of painting is very obvious in the rocks, which are the sort of vertically stacked, round-edged stones found in the Mughal and Harivamsa paintings discussed in an earlier segment. The clouds (megh is Sanskrit for 'clouds') in this scene also follow the Mughal style. In the Bikaner paintings of Krsna above and below, we again see the point of comparison mentioned yesterday regarding the shape of faces. 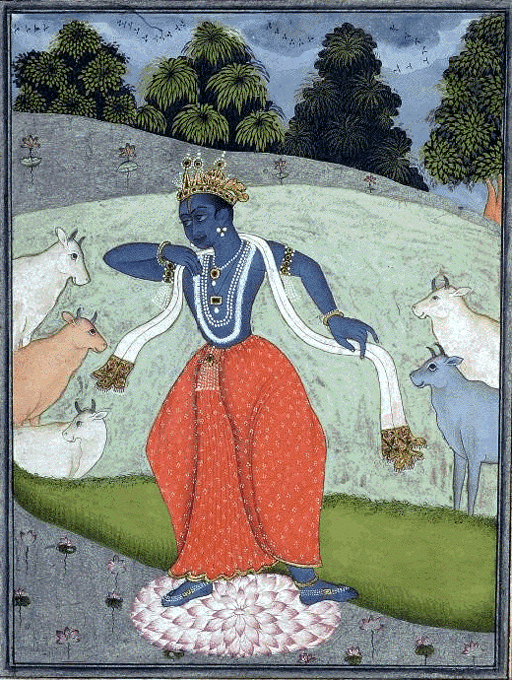 Following the Persian style, the image of Krsna dancing with the cows is distinctly rounded. In the Megh Malahar painting, however, we see the sort of angular faces typical of later Rajasthani Vaisnava paintings, even though the mountains and clouds in this piece are distinctly Mughal. 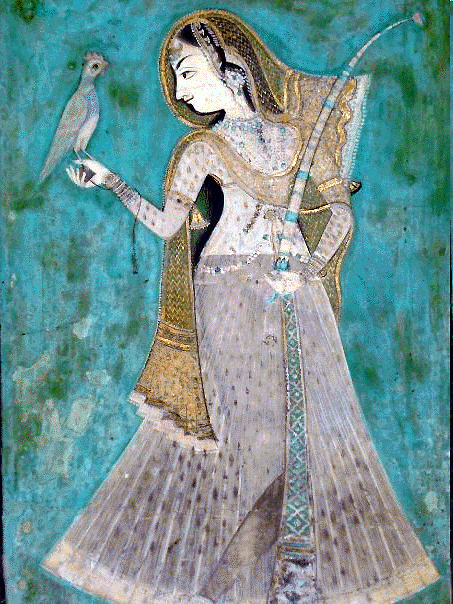 The Bundi painting of the Woman with bird, below, also features the very rounded Mughal-style face, and the ornament work in Her sari is also reminiscent of the Persian style. The Chunar Ragamala painting done under Akbar's rule (c. 1591), featured in an earlier segment, is considered to be an important example of the transition of influences from Vaisnava to Mughal coming from the Bundi School artists. While they continued to paint Vaisnava devotional themes, the Mughal influence continued to be seen in their paintings up to the 19th century. In much the same way that the Bundi artists maintained their love of Vaisnava themes, protecting their field of devotional art, so did their contemporaries in other schools of the region – the Amber, Bikaner, Kota, Kishangarh, Malwa, Marwar, Mewar, and even Gujarati schools. Likewise, the Rajputs protected Hindu India. Given their geographic placement in the northwest, the Rajputs served as the guardians for all of India, staving off the constant threat of Persian invasion. The Rajputs, descended from Vedic culture's fierce kshatriyas, became known as the pratiharas, or doorkeepers of mother India. Eventually there was a renaissance of Vaishnavism in Rajasthan, and a fervent return to images of Sri Krsna's pastimes. Vallabhacharya helped to propagate the bhakti movement, and there was a renewed interest among artists in the northwest to depict scenes from Jayadev's Gita Govinda, the Rasikapriya of Keshavadasa, and the Bhagavata Purana. Throughout many of these paintings, however, a subtle influence of the Persian style remained, but by now, more decoration than imperative religious iconography.